Find out why this cleaning combo is a hazard waiting to happen—and how to avoid it while you sanitize and disinfect around the house. Heavy-duty dirt, grime, mildew, and mold accumulations call for powerful household cleaners. And chances are you have two of the most potent—bleach and vinegar—in your cleaning cabinet right now. Used alone, these cleaners are safe and effective in the kitchen, bathroom, and beyond. But mixed, whether deliberately or accidentally, they combine to create a toxic, potentially fatal, product. Keep reading for the facts about what happens when you mix bleach and vinegar and how proper use of these cleaners can help you avoid making a dangerous, all-too-common mistake. Chlorine bleach is useful for its disinfecting and brightening properties, while vinegar is known for its sanitizing, stain removal, and deodorizing powers. So it’s no wonder that people might mix the two in hopes of creating a potent all-purpose cleaner—only to get way more than they bargained for, and none of it good. The active ingredient in chlorine bleach is the alkaline (a.k.a basic) chemical compound sodium hypochlorite. When powdered or liquid chlorine bleach mixes with an acid—in this case, vinegar (acetic acid)—the sodium hypochlorite turns into hypochlorous acid, which emits chlorine gas into the surrounding air. Chlorine gas is highly toxic—so much so that during World War I, a potent variant of it was used in trench warfare to knock out Allied troops. The gas gives off an extremely pungent smell, and while it looks yellow-green in large volumes it is invisible in small quantities. Burning, reddening, or blistering skin. Long-term exposure can lead to pulmonary edema (i.e., fluid build-up in the lungs), which can prove fatal. Generally, the level of gas exposure and the severity of symptoms are greatest when full-strength (i.e., undiluted) bleach is mixed with vinegar. However, the risk of chlorine gas exposure remains when water-diluted bleach is mixed with vinegar. If you think you’ve been exposed to chlorine gas, the CDC advises you exit the area of exposure, remove exposed clothing, thoroughly wash your skin with soap and water, and get medical attention. Even if you don’t deliberately combine bleach and vinegar, occasions arise when you might accidentally mix the cleaners during everyday household chores. Here are some tips for keeping the two potent cleaners separate in some of the most common scenarios when that might happen. Use either vinegar or bleach—never both—in a single wash cycle. 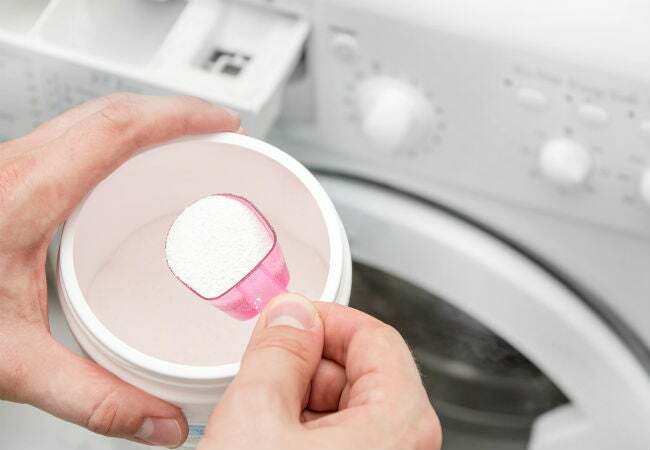 To remove stubborn stains or brighten white fabrics, some people pre-treat washables with vinegar and then throw a half cup of bleach into the bleach dispenser of the washing machine. But the mixture of vinegar in the garments and bleach in the wash water can emit chlorine gas into the machine, and you’d risk exposure when removing the load of laundry. Always clean and dry interior components of the coffee maker first and then move on to clean the exterior of the unit. 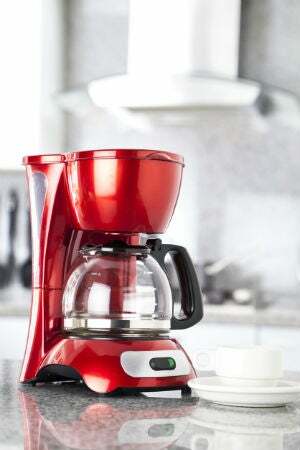 Homeowners who use an equal parts vinegar-and-water solution to flush out the inside of a coffee maker and a solution of one teaspoon bleach and a half-gallon of water to clean the outside of the machine should take care not to mix the bleach and vinegar. Thoroughly wash and dry cutting boards before using vinegar during food prep. Home cooks who sanitize their butcher block cutting boards with one teaspoon bleach and a half-gallon water and then expose the board to vinegar while preparing food are at risk. When preparing a bathroom disinfectant, always fill up the spray bottle halfway with water first and fill the second half with either bleach or vinegar. DIY mold removal procedures often call for spraying down tubs or showers with an equal parts solution of water and either bleach or vinegar as a final step to remove bacteria and prevent new mold growth. It’s all too easy to slip up and combine vinegar with bleach in that same bottle. Always filling with water first will ensure that you don’t have room to add the two potent cleaners together. 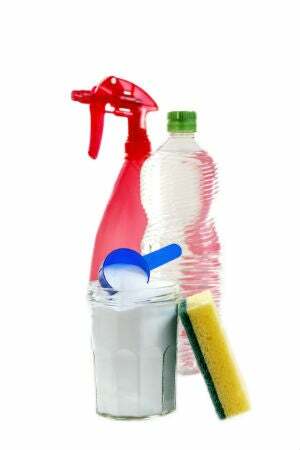 Label all containers that hold bleach or vinegar, and keep them (and all cleaning supplies) away from children. 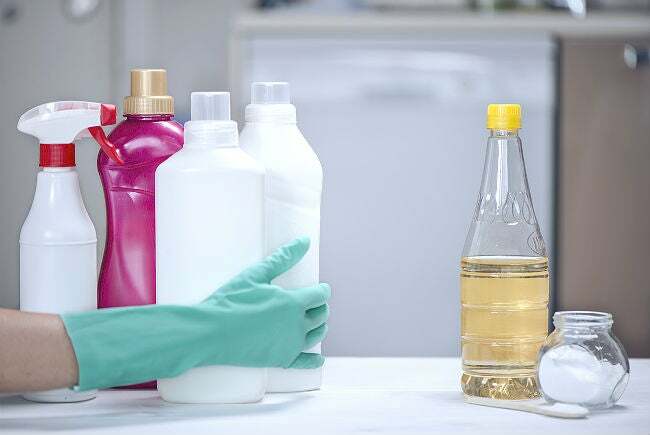 When refilling unmarked bottles of cleaner in the supply closet, you might inadvertently add vinegar to a bottle that already held a small amount of bleach or vice versa. Heavily soiled surfaces may benefit from a vinegar application after a bleach application or vice versa. To use bleach and vinegar separately, one after the other, completely rinse the first cleaner from the surface with water and dry it before applying the other to prevent the two from mixing and emitting chlorine gas. Consider dingy tile floors or shower walls, for example. You may wish to use a solution of equal parts chlorine bleach and water to eliminate mold from the grout and sanitize the tiles themselves with a solution of one-half cup vinegar and one gallon of water. In this scenario, tackle the grout first with the bleach solution, rinse it with plain water until one of the bleach solution remains, dry the grout with towels or air-dry completely, and only then apply the vinegar solution to the tiles.